He also wrote the controversial article 3 Reasons the Squat is NOT the Cornerstone of Strength Training for Sprinters (a recommended read) and 3 Great Warm-up Exercises for Strength Training. 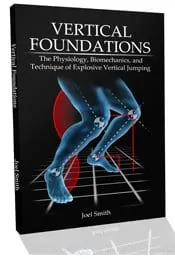 The Science of Vertical Jump Force Production in the Lab: A sample from “Vertical Foundations”, Chapter 11. The goal in teaching any athlete how to jump better is to smooth out their force-time curve. You don’t need any fancy technology to pull this off (although it can certainly help if available). To “smooth the curve”, coaches and athletes should be aware of loud, mechanical jumps. Noise from an athlete’s feet slapping down are a good sign of excessive passive jump forces. Teaching jumping, plyometric and landing drills with an emphasis on smooth and extremely quiet movement will go a long way in helping an athlete to express force better, without a need for a 10,000 dollar force plate. 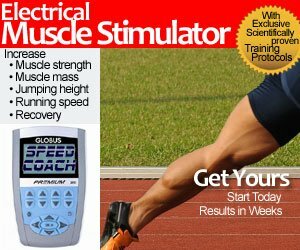 Expert track and strength coaches have been doing this for years. Figure 11.3: Force/time curve of novice vs. advanced jumpers. I’ll often have my athletes perform drills or jump landings where their goal is for me not to hear them move, which ensures a smoother curve. A quiet jump means that the athlete makes good use of the stretch-shortening cycle, and doesn’t waste energy. Through studying force-time curves on the plate, I have found that a smoother overall curve means that an athlete is good at transferring forces to the ball of the foot and keeping the heels from crashing to the ground. A basic, rudimentary coaching point in depth jumps is if the heel is crashing down, then the depth jump was from too high! Athletes with smooth and powerful jumps will look more like the solid black line of the graph in figure 11.3. There are always going to be significant differences in the way that beginner and advanced athletes produce force. A large variance will also exist in the way that skilled single leg and double leg jumpers look in a depth jump analysis. Knowing this has implications for the way that we train, as well as how to instruct athletes in plyometric activities. In order to jump well off of one or two feet, athletes must become masters of force production. 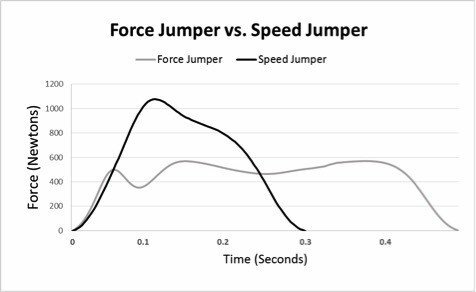 Figure 11.4 is a graph of the force generation patterns of a skilled speed oriented jumper (All-American high jumper) and a skilled two foot jumper (skilled dunking athlete). This shows that while both jumpers have fairly smooth force curves, a predominantly double leg jumper can still get away with creating some passive forces. Figure 11.4: Force plate analysis of a force jumper vs. speed jumper. This doesn’t mean that it is optimal to put large forces through the heel or flat of the foot when jumping off of two legs, but it won’t hurt an athlete jumping off of two legs the way it does in a single leg jump. Of particular note is the long, smooth curve of active force production that the double leg jumper displays and the rapid peak in force the single leg jumper achieves. These types of force production are both very distinctive to how the athletes jump in their competitive environments. The long smooth force curve of the force jumper can be great for two leg jumping, but this habit can also hurt quick jumping, as well as the elastic strength needed for single leg jumps. Force dominant jumpers often make extremely fast gains through the use of a plyometric program with high contact volumes, as this strengthens their ankles and improves conversion from passive to active forces. Barefoot training is a great way to teach athletes the stiffness through the feet that quick jumps and good single leg jumping requires. Anecdotal experience has shown that barefoot style training has led to good increases in single leg jumping ability for those athletes with initially poor foot strength and function. With long term training, double leg dominant jumpers seeking for continual two leg jump improvement should focus more on plyometric and power drills that allow more time for force expression, such as a power oriented depth jumps, squats and Olympic lifts. 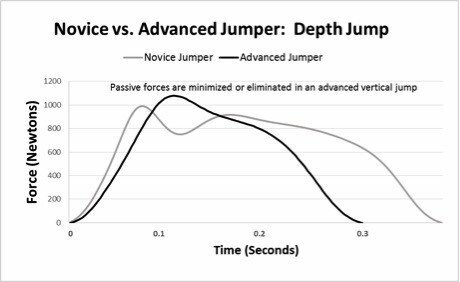 Bottom line, force jumpers should spend time on their weak points for quick improvement and well-roundedness, but ultimately they’ll need to play to their strengths for long term development. On the other hand, good one leg speed jumpers have almost no passive forces in a depth jump. They are masters of smooth and efficient force conversion in a short time period. Since these jumpers don’t tend to produce forces over long periods of time naturally, basic strength training movements such as squats and deadlifts can prove extremely helpful. Strength training will help teach the nervous system of these jumpers to produce force over a longer time period, which nearly always yields nearly instantaneous gains in two leg jumping ability and standing vertical jump. Although strength work will yield some quick results to make a speed jumper more well-rounded, strength focused training isn’t always the sole key for longer term specialized performance for these athletes. All jumpers should be taught to be smooth, but single leg jumpers need to focus particularly on jumps and drills that focus on keeping good landing stiffness to allow them the continual maintenance and improvement of their single leg ability. Speed jumpers will do well to capitalize on their strengths over time, which are high-intensity plyometrics that include high depth jumps, bounding, hurdle hops, and other forms of shock training. READ Why Do You Hear the Gun AFTER the Sprinters Leave the Blocks?